Heat oven to 425°F. Place mole sauce in medium saucepan. Gradually add broth, stirring with wire whisk until smooth. Cook over medium-high heat, stirring often, until thoroughly heated. Meanwhile, place chicken in small microwavable bowl. Cover with microwavable plastic wrap, folding back one edge or corner 1/4 inch to vent steam. Microwave on High 1 to 2 minutes or until thoroughly heated. Spray 11x7-inch (2-quart) glass baking dish with cooking spray. Spoon 1/3 cup chicken down center of each tortilla. Spoon 1 tablespoon sauce over chicken on each tortilla; fold 2 sides toward center. Place enchiladas, seam sides down, in baking dish. Pour remaining sauce over enchiladas. Bake uncovered 9 to 10 minutes or until thoroughly heated. 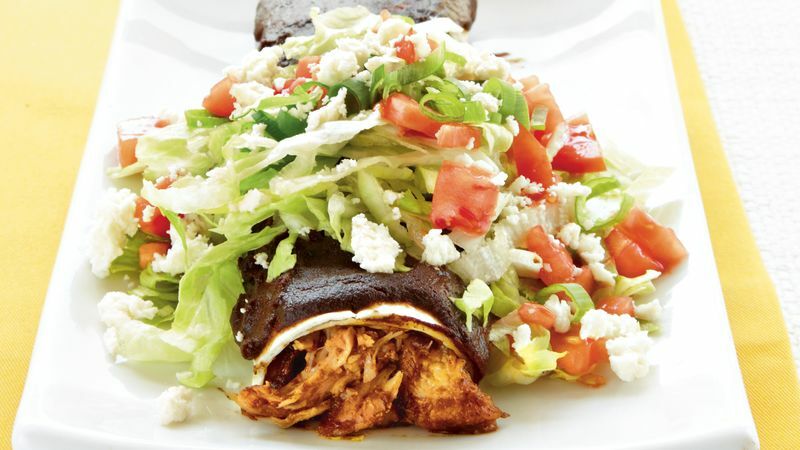 Place 1 enchilada on each serving plate; top with lettuce, tomato, cheese and onions.